For Sherie and Ben, and co-visitors Mike and Lexi, today was to be the last ride from the ICC. Last evening we celebrated by toasting with Prosecco sparkling wine, a very light and refreshing libation for a warm summer evening. We enjoyed the wine on the veranda before dinner, and with dinner in the dining room. 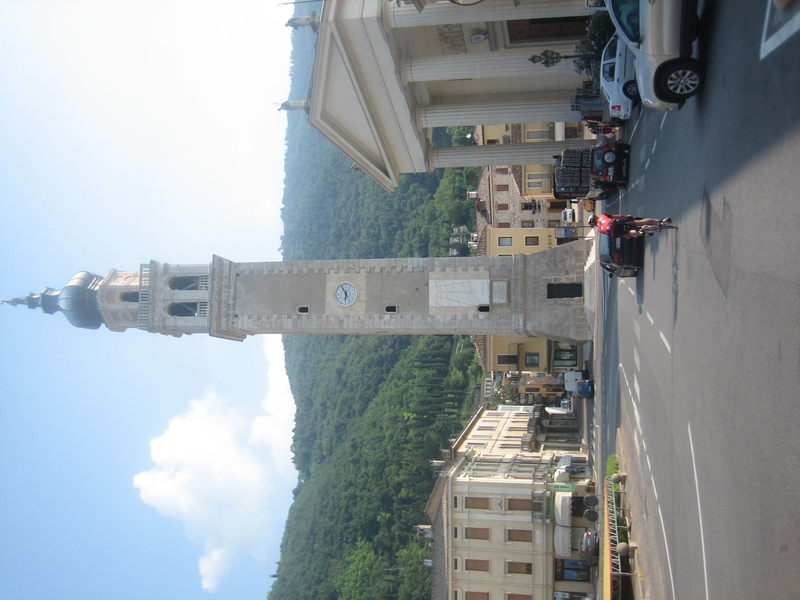 Prosecco is a regional wine from very near here, and was the appellation through which we passed on today’s ride. George led us out of the hotel due east, traversing upward with occasional downhills rollers across the face of the mountains. 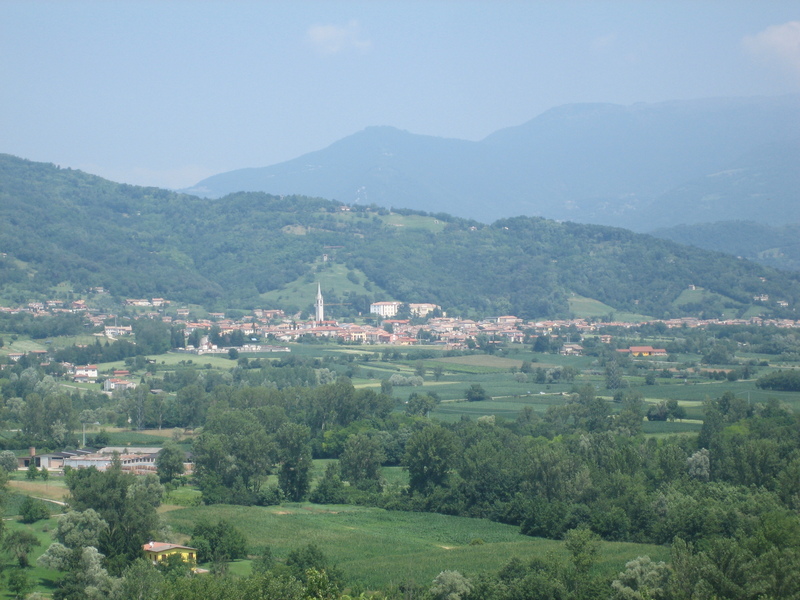 After a slow warm up, we moved at a good steady pace, through the villages, lush countryside, and corn fields, with the steep mountain slope on our left and the valley floor becoming more distant on our right. After about an hour we had descended to a highway and riverside, moving as one in a paceline behind George. Soon enough we turned right onto a bridge across the river, starting our ascent diagonally up the slope. Vineyards were now the dominant feature, with the church steeples of villages dotting the hilly countryside. After a quick regroup, George set us off uphill, instructed to ride “our own pace” up a hill. Steep at first, then shallow, then rollers, then downhill, the road narrowed and wound through villages, then widened and straightened again. 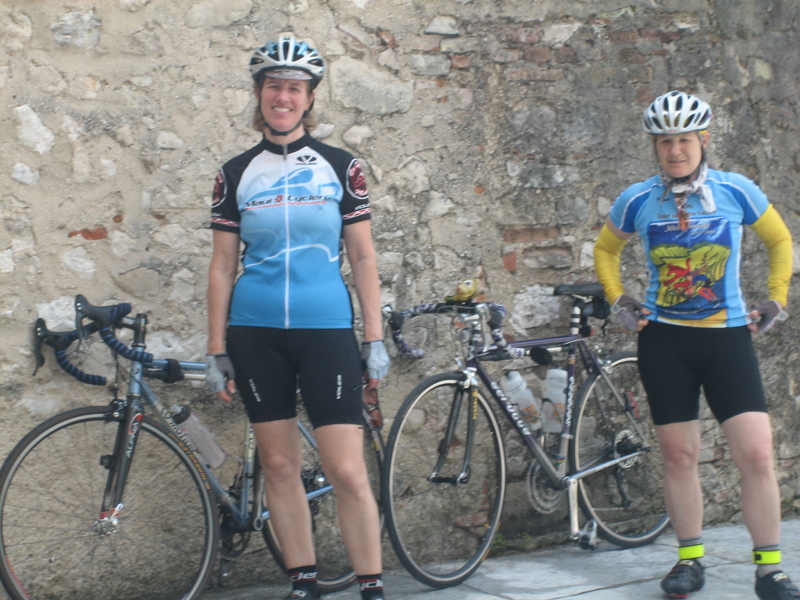 George had instructed us to stop at a hotel/cafe in Follina, were we regrouped for the de rigour coffee and pastry. 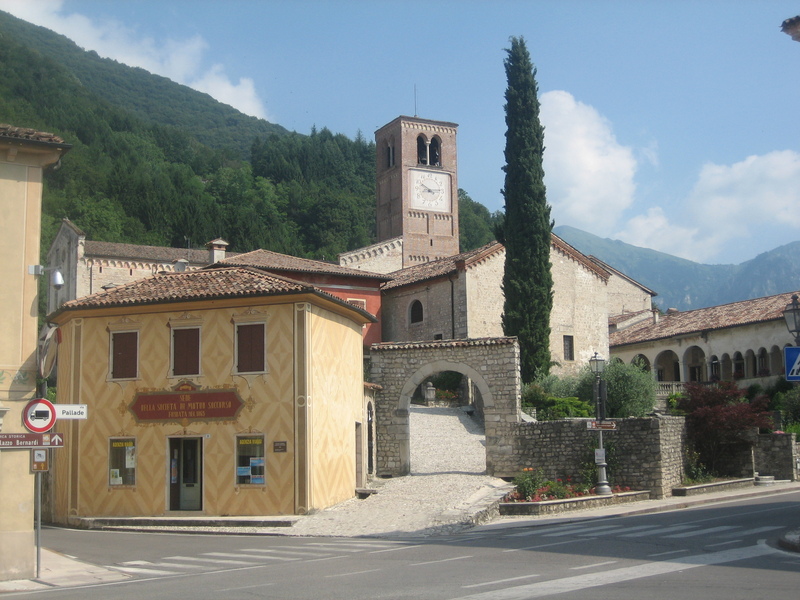 Excellent old village, beautiful cafe and bar, very nice road-side veranda; just what one knows the Italians would expect. Across the road, in fact in sight of our table, is an old abbey. 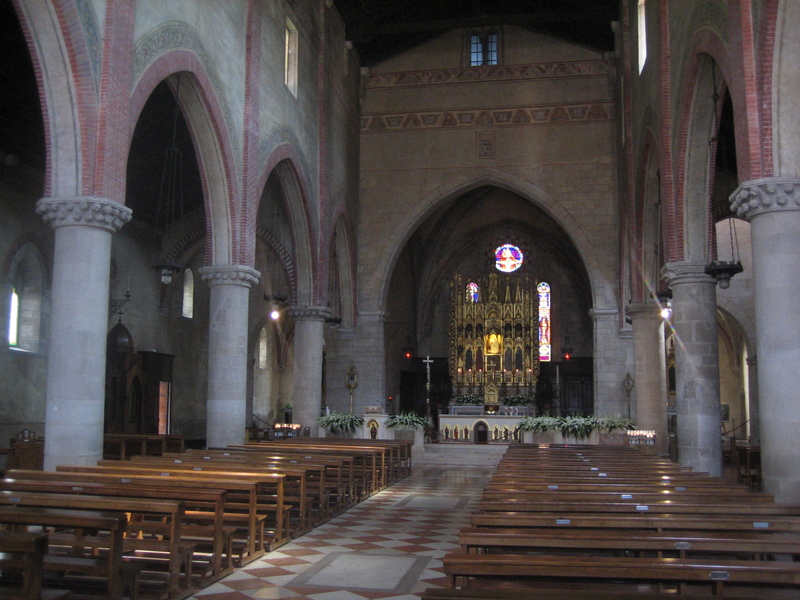 Various churches have stood on the site for over one thousand years. I believe George told us the present church dates to about 1400, although it has been reconfigured, remodeled, and restore countless times. We enjoyed strolling through the open courtyard and church, listening to George’s stories. After this nice break for refreshment and culture, it was back on the road. George choose an alternate route, looping somewhat to the south of our outward leg. Awesome indeed, mostly on small country lanes, snaking through the hillside vineyards. The terrain was rolling, many small climbs (some pretty sharp little pitches) up to ridges and passes, with views eastward over the vines and villages to the cloud-topped mountains. The terrain was familiar to out Nor-Cal legs, always rolling and twisting, much like the smaller Sonoma valleys Sherie and I enjoy so much. But the vineyards are different: taller trellises, wider spaced rows, very green grass ground cover. The buildings of course differ too: many older in various states of repair, some new but traditional, others boldly modern. The last sections of the ride had some longer stretches uphill as we worked our way back to Borso. After a swoop down the main road, I was surprised when the turnoff to the hotel appeared on the right. All agreed this was a beautiful ride; even George admitted that the scenery on the route is special. YOUR PICTURES AND DESCRIPTIONS SOUNDS SPECTACULAR!! ENJOYING THIS VERY MUCH. THANK YOU FOR SHARING. Wow, what a great trip! I’ve been to that area many times and the rides all are familiar to me!! Please say hi to George, Pat, Leopldo, Joangela (their daughter) and Silvia from me! Thanks. great photos !!! the food looks good too. Well, yes, the food is good. The Italians know food! The key problem at the ICC, at least for middle-aged clients, is that it is too easy to eat too much. Good breakfast spread, eggs on request, four course lunch and dinner: salad, primo (starch, typically pasta or rissoto), secondi (meat,often served with cooked vegs and potatoes or polenta), dessert (fruits, pastries, or gelato). When one rides 4 hours before lunch, you want to eat at 13:00. But then you get another chance to gorge at 19:30!